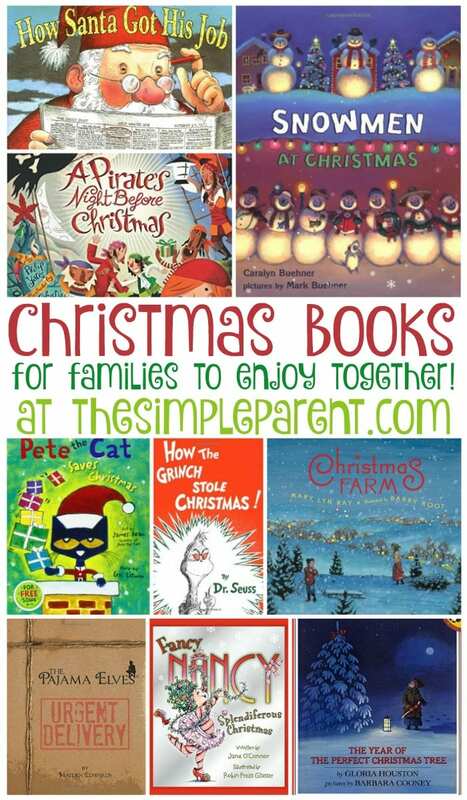 Home » Christmas » 35+ Christmas Books for Families to Enjoy All December Long! 35+ Christmas Books for Families to Enjoy All December Long! One of our favorite things to do as family is reading. As a former teacher, I’m all about reading with kids because it’s an important habit to develop but as a mom, I just love sharing the magic of books with Weston and Carrigan. So when December rolls around, I break out all of the Christmas books for families that we have! And we have quite collection! One reason we have a lot of Christmas books for families is that I like to do 24 days of holiday books with the kids! While I don’t buy 24 new books each year, I do buy a few new ones because I love them! So if you’re looking to build up your library of Christmas books for families, check out some of these! There’s over 35 titles so you’re sure to find some that your family will enjoy together! Our favorites are at the top of the list and I included our affiliate links in case you need to order a few! Whether you’re looking for Christmas books for families to share the whole month long or just a special one as part of your Christmas Eve traditions, these are some great books to add to your child’s library!